DrumWright called on the services of drum legend Bobby Orr to lend a hand with their summer World Cup extravaganza. The Reading-based drum emporium managed to do what the entire England team failed to do and generated some excitement during the four-week football feast thanks to its mass giveaway. Chris Wright, managing director for the shop, said: "Summer trade can be quiet, especially when there is good weather. With the World Cup on too, we knew we had to do something spectacular to tempt customers away from the TV screen." 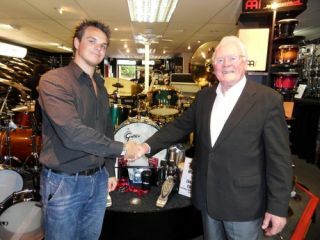 Prizes including a Gretsch USA Anniversary Kit worth over £3,600 were given away in the competition, which was open to DrumWright customers spending more than £100, with Bobby on hand to draw the winners. So, at least some good came out of the World Cup then.